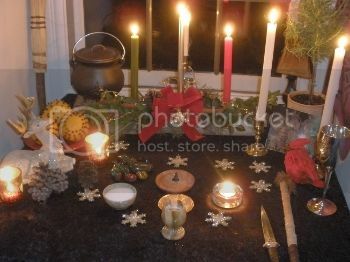 Yule Altar- It is that time of year, magic is in the air, and everyone is filled with Yuletide cheer. Out from the attics and recipe books come the family traditions. One of my favorite parts about this season is the decorations. The boughs of holly, and the wreaths of greens hung on the doors. And of course there is the tree, ornate with lights and ornaments, with presents underneath. The stockings stuffed with treats of the flaming Yule log. The Holly and the Oak King battle once again on solstice eve. What a beautiful scene to behold. But the center piece of your home would be, regardless of budget, your Yule Altar. Some people have what is known as a seasonal altar, for the different seasons and celebrations. But regardless of what, or where you are setting it up, your Yule Altar will not be complete without pieces of evergreen and holly, be sure your holly has those red berries, but keep it out of the reach of children. Cover alter table with a festive cloth and perhaps some red, white or green candles. If you can get them I suggest glass or crystal holders as the light will reflect much better on your Yule Altar. As this will be the day we are celebrating the rebirth of the Sun, then why not have an image or a statue of the Sun set upon there as well. Now as this is a time for presents why not set them on or near the altar to bless them and those who will be receiving them. I will share a personal tradition of mine, as it is the Celtic New Year, to send out wishes or letting go of past regrets. Take your cauldron, put in some pine needles, angelica and some nettle, to ward off evil and give protection to your work and poor some rubbing alcohol in over it. Everyone can take a small slip of paper and write down your new years resolution, or something you wish to let go of and throw it into your lit cauldron. I must confess Yule is my favorite time of year. The lights, the smells, the sounds are more intoxicating than the rum punch Uncle Willie makes. It is the new year, the time we show our thanks for the gifts of last year and the hope for the good things to come in the next. So get started, Yule is almost here and magic is in the air.